Greatwood was established by Nigel Wuerzer to design and make fine contemporary freestanding furniture to commission. We are pleased to accept commissions from both private individuals and other organisations. 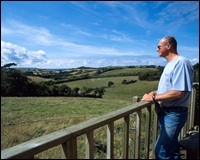 Our well equipped workshops are located in the scenic countryside of Somerset. After obtaining a Masters degree in Engineering Nigel spent 20 years in the oil industry. As time permitted throughout this period he developed his knowledge of furniture and his woodworking skills. These were further refined by then undertaking a year long intensive course with an existing supplier of bespoke furniture. Whilst an engineering background is clearly an advantage in creating fit-for-purpose functional structures of wood, we also strive to create elegant and enduring pieces of furniture. We do not seek to elicit a momentary visual impact, which is quite achievable by inappropriate use of contrasting timbers or by creating chic but non-functional structures. Instead, through sound but imaginative design and the subtle use of beautiful woods, we aim to gradually arouse the onlooker’s tactile and visual senses. Quite simply, we want our clients to develop and enjoy a strong sense of affinity with their special piece of furniture.